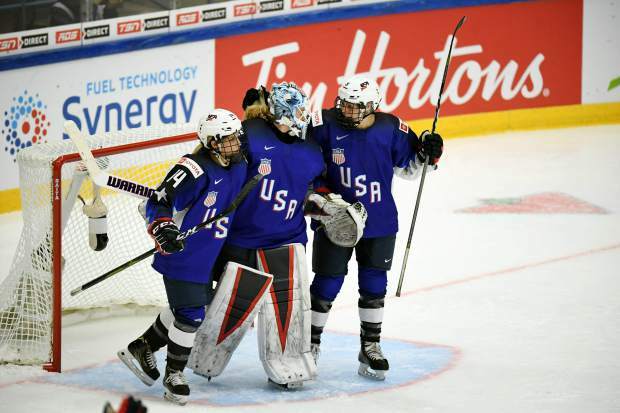 Brianna Decker, left, Alex Rigsby and Cayla Barnes of Team USA celebrate winning the 2019 IIHF Women's World Championships preliminary match between the USA and Canada in Espoo, Finland on Saturday. 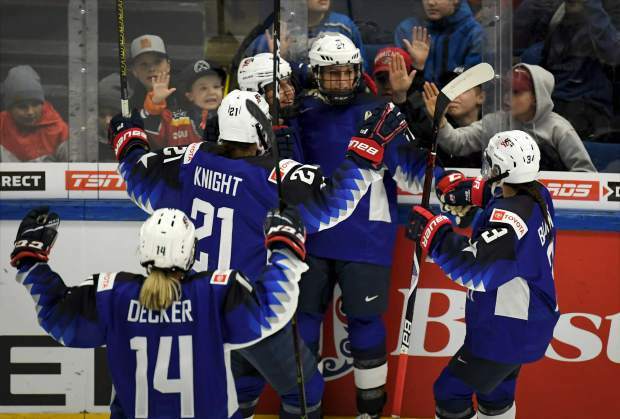 Team USA celebrates a goal during the 2019 IIHF Women's World Championships preliminary match between the USA and Canada in Espoo, Finland on Saturday. 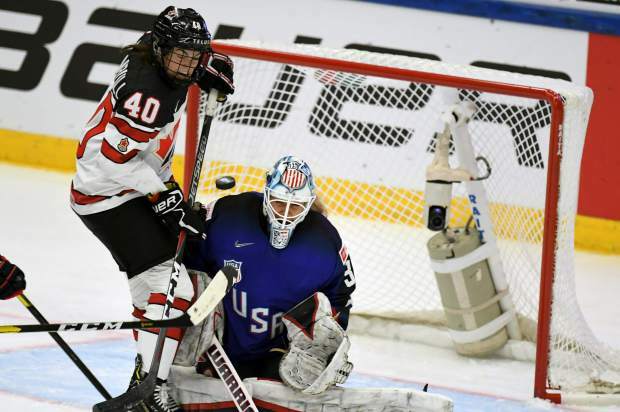 Goalie Alex Rigsby ofTeam USA and Blayre Turnbull of Canada, left, are in action during the 2019 IIHF Women's World Championships preliminary match between the USA and Canada in Espoo, Finland on Saturday. Team USA celebrates a goal during the 2019 IIHF Women's World Championships preliminary match between USA and Canada in Espoo, Finland on Saturday. 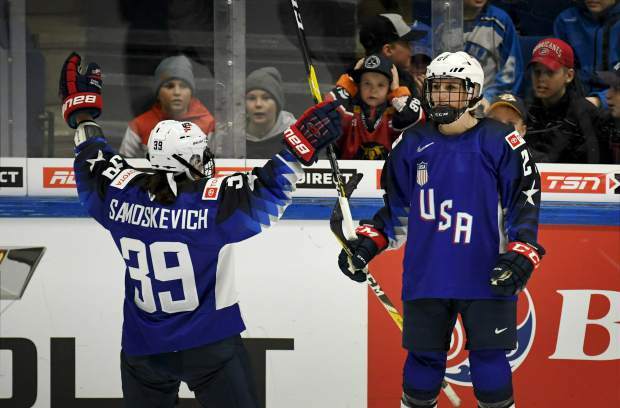 Melissa Sasmos Kevich, left, and Annie Pankowski of Team USA celebrate a goal during the 2019 IIHF Women's World Championships preliminary match between USA and Canada in Espoo, Finland on Saturday. 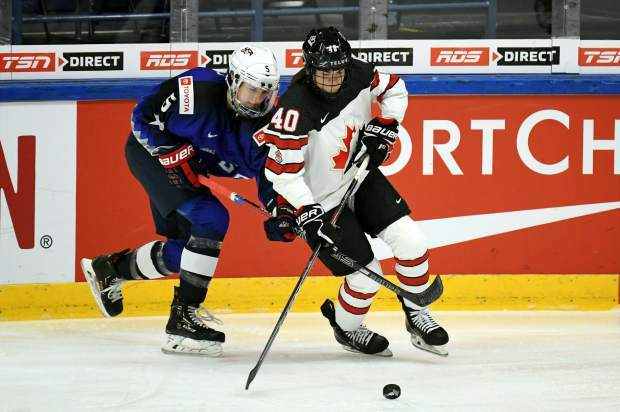 Megan Keller of Team USA, left, and Blayre Turnbull of Canada are in action during the 2019 IIHF Women's World Championships preliminary match between Team USA and Canada in Espoo, Finland on Saturday. 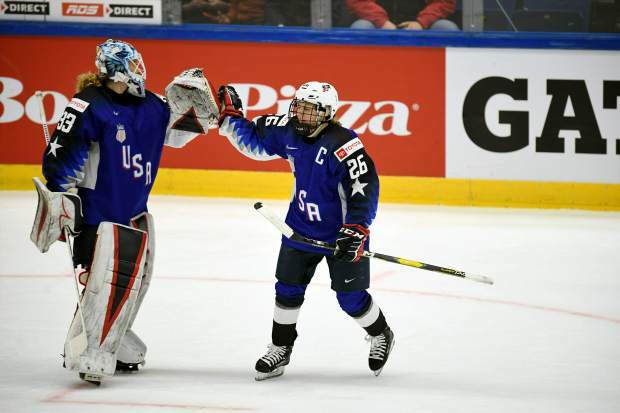 Goalie Alex Rigsby, left, and Kendall Coyne Schofield of Team USA celebrate a goal during the 2019 IIHF Women's World Championships preliminary match betweenTeam USA and Canada in Espoo, Finland on Saturday. 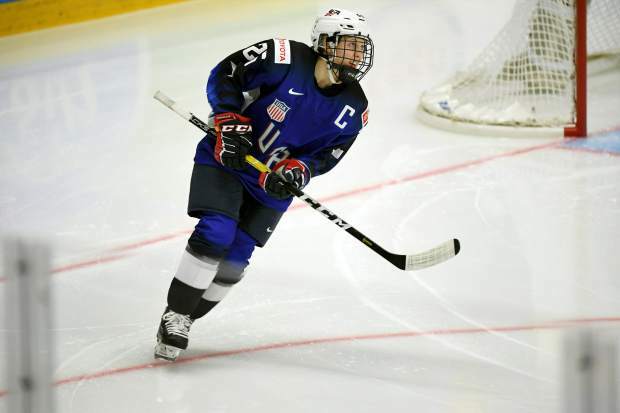 Kendall Coyne Schofield of Team USA competes during the 2019 IIHF Women's World Championships preliminary match between USA and Canada in Espoo, Finland on Saturday. ESPOO, Finland — Annie Pankowski scored the winning goal on a second-period power play Saturday, leading the United States to a 3-2 victory over Canada at the women’s world hockey championships. Hilary Knight and Kendall Coyne Schofield also scored for the Americans while goaltender Alex Rigsby made 31 saves. Pankowksi put a slap shot over Maschmeyer’s right shoulder at 14:03 of the second period for a power-play goal. Canada had a power play with 2-and-a-half minutes to play, but it was negated by Natalie Spooner’s hooking penalty with a minute remaining. For the championship tournament, the U.S. has six points and is alone in first in Group A.
Canada dropped into a tie with Finland and Russia, all with three points apiece. Switzerland is winless in two games. Brianne Jenner had a goal and an assist in her 100th career game for Canada. Sarah Nurse also scored and Brigette Lacquette assisted on two goals. Goalie Emerance Maschmeyer turned away 27 shots.